Clark School alumnus Thomas W. Hicks (mechanical engineering), deputy assistant secretary of the U.S. Navy for energy, will serve as the Clark School's winter commencement speaker on December 20. The ceremony will take place at 3:30 p.m. in the Cole Student Activities Building. Hicks serves as the focal point on all matters pertaining to the Navy's energy conservation, energy efficiency, energy sources and green initiatives. Prior to his role with the Navy, Hicks worked with the U.S. Green Building Council, where he led Leadership in Energy and Environmental Design activities. 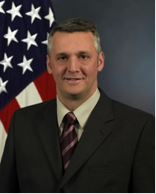 He also has worked with the U.S. Environmental Protection Agency and the U.S. Navy Public Works Center. The student speaker at the ceremony will be civil engineering senior Christina Reynolds. UMD's commencement ceremony will be held on December 19 at 7 p.m. in the Comcast Center.